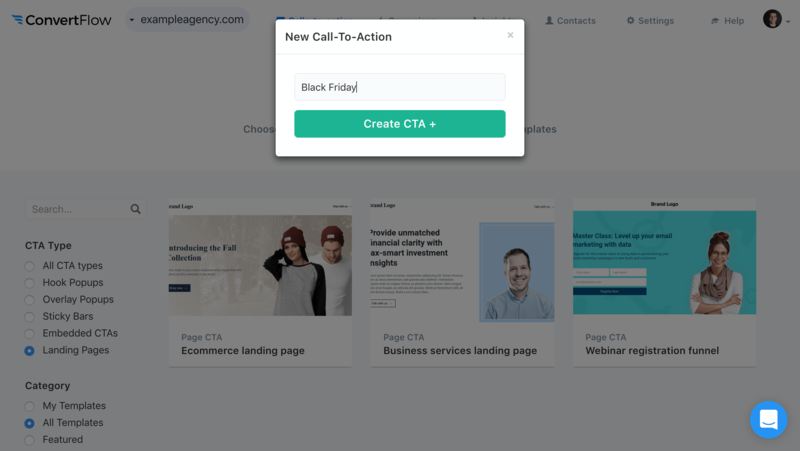 One of the call-to-action types you can create in ConvertFlow are landing pages. 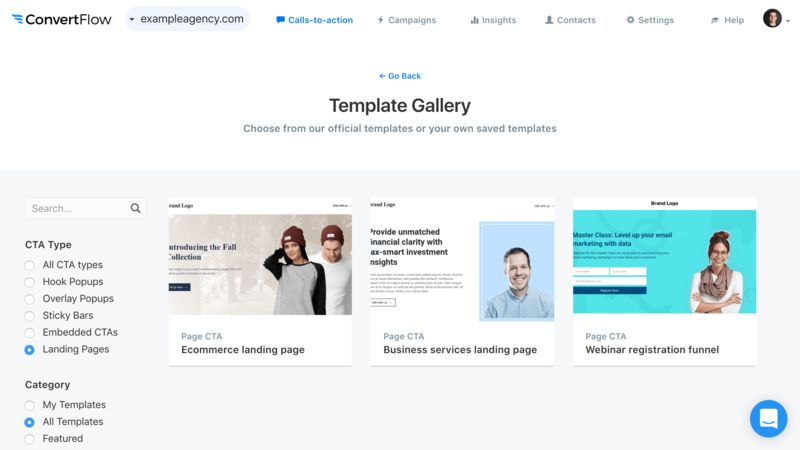 When creating a new CTA, scroll past the suggested template categories, then click to move your mouse over landing page CTAs to click through to see templates. You'll be taken to the template gallery, filtered to only see landing page CTAs. 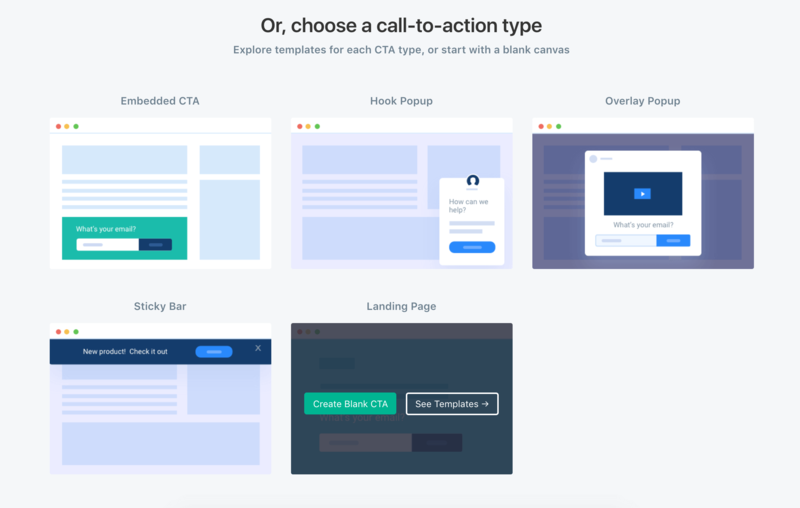 Once you've found that looks like a good starting point for your landing page, click the "Use Template" button on the template and name your new landing page CTA. Once you've created your landing page CTA, you'll be taken to the CTA builder. Here you can quickly customize the CTA template. Edit the headlines, paragraph text, button text, form settings and more. 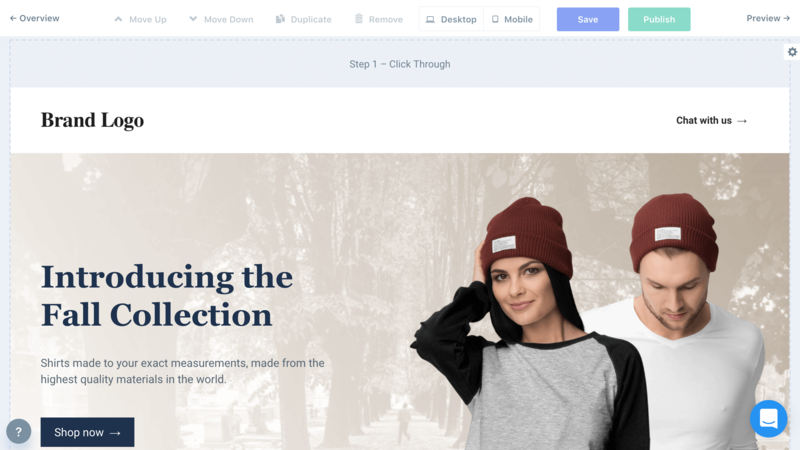 Once you're done customizing the template, click to preview the landing page CTA. Then, you'll be able to preview and test out your landing page in a safe test environment. Testing your landing page CTA doesn't count towards CTA stats, and it doesn't trigger automations. 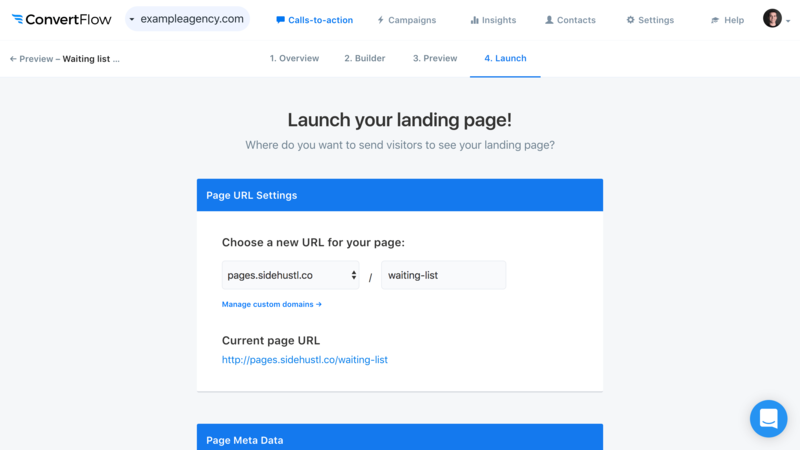 Next, click "Launch" to control on which domain name and URL path your landing page will show. Here you can control on what domain and what URL you want your landing page to display on. You can either have your landing page displayed on your website's reserved sub domain on convertflowpages.com, or you can choose from any custom domain you've added to the website. 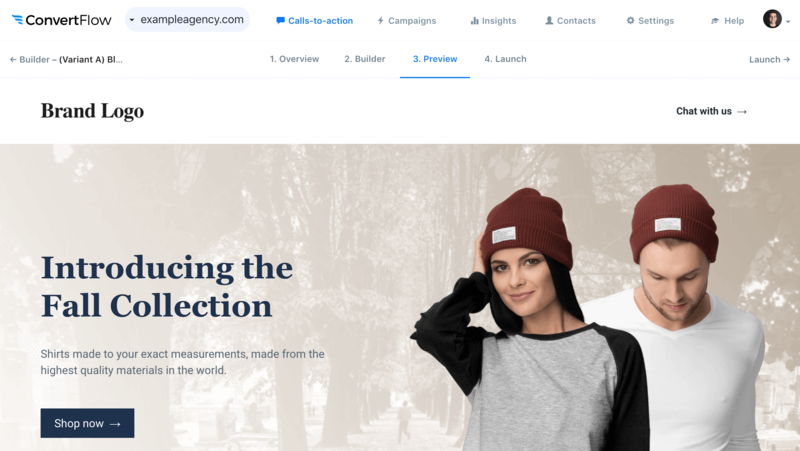 To use a custom URL for your landing page, choose a domain from the dropdown, and then type a URL path for the page to be accessible on that domain. Click save and your page will be accessible on the link given below. If you want to control the page's meta title, description and more, scroll below and you'll be able to manage your landing page's meta data. By default, your ConvertFlow landing pages won't be indexable by search engines. You can optionally enable indexing if you want your landing page to be found on search engines. Meta titles aren't just used by search engines, they're used in link previews on social media, in messengers and more. 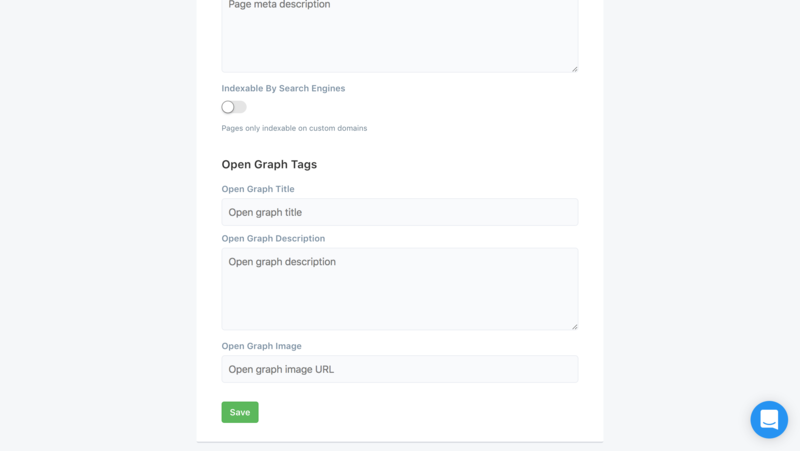 If you need to differentiate the page title and description for search engines and for social media, you can control the "open graph" meta titles, descriptions and preview image, which will be used for social feeds and messengers, but not search engines.